I was saying yesterday morning that the statistical odds were stacked against the bear side yesterday, and that the stats suggested that Wednesday's bearish engulfing candlestick on SPY was unlikely to confirm, which of course it didn't, in a day where most of the previous day's losses were regained. While Thursday has been the most bullish day of the week since the October low however, Friday has been the most bearish with, within a strong 300pt+ uptrend of course, 11 up closes and 9 down closes. I would note however that 5 of those up closes were in the 19-24 range, with a net 84 points made on all Fridays during this period, so overall gains on Fridays have been above the 60 point average for weekdays over this period. 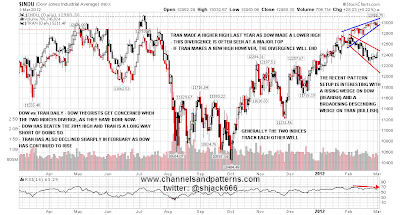 The last chart is a superb chart from my twitter friend Gann360, who used to blog under the name Joe8888. The chart looks at the impulse waves up since 2009 and how long each one lasted without having at least a 3% correction. 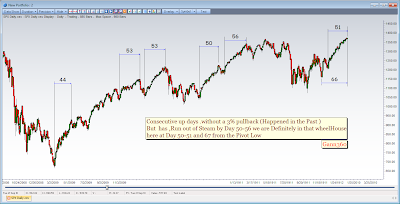 There have been four such big moves since the first spike from the July 2009 low and they lasted between 50 and 56 days without that correction. 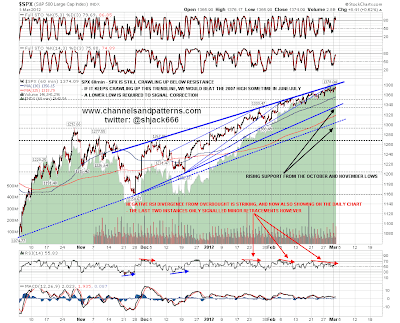 Joe did this chart yesterday and as of yesterday the current uptrend on SPX had gone 51 days without a 3% correction. 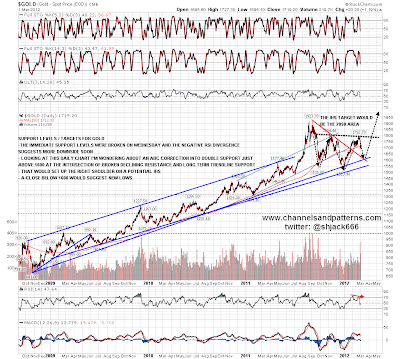 If you use twitter and like interesting charts I'd strongly recommend following Gann360, and in fact I initially joined twitter to follow him. I'm leaning short today, as EURUSD is still trending down hard and the immediate setup on ES looks weak. I'm doubtful about seeing that persist into next week as EURUSD is now not that far away from my target trendline, and if we see EURUSD bounce strongly there then any downtrend on SPX would be fighting against an uptrend on EURUSD. 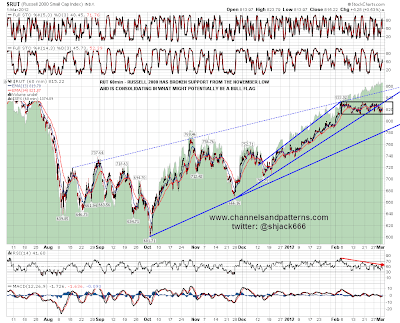 Looking at my longer term EURUSD and USD charts I'm doubtful about seeing a serious break down on EURUSD as yet.